A frequent debate among index fund investors involves “tilting” or over-weighting particular asset classes. Usually, the asset classes to be over-weighted are small cap and value stocks. Some investors believe that a portfolio tilted towards small cap and value is superior to a market-weight portfolio. These investors believe that over-weighting these asset classes (relative to market-weight) and under-weighting other asset classes increases the likelihood of a superior outcome ( i.e. higher returns, lower risk, or both). Other investors believe that a market-weight or TSM (Total Stock Market) portfolio is the best choice. These investors believe we don’t know which asset classes are most likely to outperform in the future, and that the market weights reflect the best balance of risk and reward given the information available to investors at any particular time. Debates often involve detailed analysis of past performance which, of course, has only limited value for forecasting the future! Nevertheless, even making apples-to-apples comparisons of past performance is complicated because “live” index funds which track the various asset classes have been available for a relatively short time. Academic datasets for TSM, small cap, and value indexes exist for longer periods of time (back to 1926 for U.S. stocks), but these indexes do not account for fund expenses and trading costs. Also, they sometimes involve extreme tilts toward illiquid stocks which are difficult for index providers to implement in practice. In this post, I will evaluate the Fama-French factor loading for several “live” index funds, and I will then use the regression coefficients and alpha (which should capture expenses and other costs) to construct “pseudo-funds” which cover the full range of the academic data from to 1926 to present. These pseudo-funds are an attempt to adjust the historical data for the expenses, trading costs, and modest factor loadings that we typically see with today’s live funds. 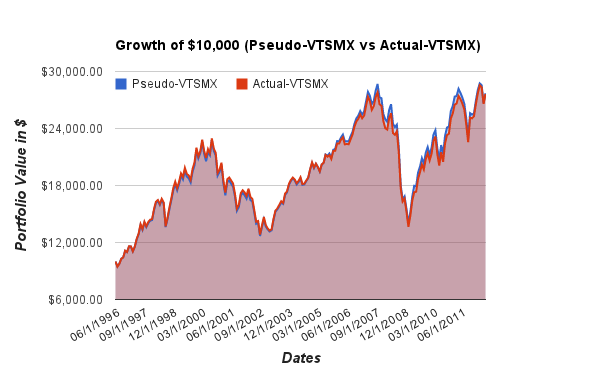 The pseudo-funds can be used to compare realistic TSM and tilting strategies over an extended historical range. Since we can’t know the future, I don’t think this post will settle the debate on tilting (No chance! ), but this is my best attempt to look at the historical data through a fair lens. The Vanguard fund was chosen because Vanguard is an industry leader in low-cost index funds. The Dimensional Fund Advisors (DFA) funds were chosen because DFA is a favorite of investors who tilt towards small cap and/or value stocks. DFA specializes in indexing strategies which target particular asset classes, and they are known for their ability to minimize trading costs for small and micro cap stocks. The DFA U.S. Vector Equity Fund is a broad equity fund with a small value tilt. I consider this to be a one fund strategy for investors who want to invest across asset classes while overweighting small cap and value. The DFA U.S. Small Cap Value Fund specializes, as the name suggests, in small cap and value stocks. Since this fund only invests in a small corner of the market, holding 100% of your portfolio in this fund would represent an extreme tilt towards small cap and value. The 50/50 strategy is a annually rebalanced portfolio of VTSMX and DFSVX. The 50/50 portfolio is not the mean-variance optimal combination of the two funds, but I chose to stick with a simple 50/50 split. The mean-variance optimal split between the two funds can only be known ex-post, so it isn’t a practical ex-ante portfolio choice. The pseudo-funds are constructed by first calculating the factor loadings and alpha (using Fama-French 3 Factor Model) for the three live index funds. The monthly returns used for the regression analysis were calculated from the adjusted price data available on Yahoo! Finance. The Yahoo! data may not include the price data for the full history of the fund, but I used all data available from Yahoo. The factor loadings and alpha are then applied to the historical Fama-French factors to calculate the pseudo-fund monthly returns over the full range of available Fama-French factor data (7/1926-6/2012). Since R^2 is high for each of the regressions, the pseudo-fund returns should match the actual fund returns fairly closely. As a sanity check, I graphically compare the growth of $10,000 using actual returns and pseudo returns over the date ranges where live returns are available. I converted the monthly returns calculated above to annual returns, and I ran some statistics on these annual returns. The first table includes a summary of the pseudo-fund returns based on the full Fama-French dataset from 1927-2011. Note that 1926 and 2012 were only partial years, so I excluded them from the analysis. The second table has the same statistics for the period from 1963-2011. Prior to 1963 the Compustat data was not available. The pre-1963 database was first constructed by Fama, French, and Davis, and more recent research has improved the pre-1963 dataset further. Still, there are fewer stocks in the database prior to 1963, and some have questioned the completeness of this earlier data. So, I’ve run the stats with these years excluded. All the annual return data and statistical calculations used to create these tables is available as a Google Docs Spreadsheet. There is a sizable increase in returns for the tilting strategies, but the risk is also higher. For the full dataset, the tilting strategies have higher standard deviations, and they have lower minimum returns over one-year and ten-year horizons. However, using the Sharpe ratio, the “risk-adjusted” returns of the tilting strategies which use Pseudo-DFSVX are higher than the TSM (Pseudo-VTSMX) stategy. The tilting strategy which uses Pseudo-DFVEX is very similar (when judged by the Sharpe ratio) to the TSM strategy. For the Pseudo-DFSVX strategies, the mean-variance risk adjusted advantage is 1.08% to 2.93% per year (depending on the horizon and degree of tilt used). This is a very large advantage, but keep in mind that advisor fees and taxes are not included in the returns. These are likely to be higher for tilting strategies, and any estimated cost should be deducted from the return advantage. The tax costs could be particularly high for the 50/50 strategy which rebalances annually. Another concern is that the Sharpe ratio is an incomplete measure of risk. This is a complex and important topic, but a review of views on risk is beyond the scope of this post. I tried to at least partially account for this by showing additional statistics on worst-case historical performance, but a complete risk measure is more likely to be more subtle that any of the simple stats in my summary. Finally, tilting involves relatively frequent trading of less liquid stocks, so fund implementation is important! This can be seen in the summary statistics. 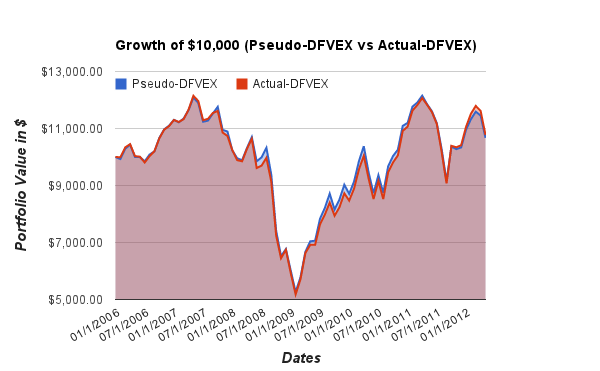 The DFSVX fund does a good job of achieving a significant tilt with a relatively small negative alpha. It provides a large improvement in the Sharpe ratio when combined with VTSMX. On the other hand, DFVEX has a much more negative alpha, and, despite its higher returns, it performs very similarly to VTSMX on a mean-variance (Sharpe ratio) basis. Good question, but I don’t have a good answer! I probably should have looked at the Vector fund and SV fund over a common time period (I used max available data for both) to rule out any time period specific issues. For example, if there were particularly high re-balancing costs during the financial crisis, it would hurt Vector more because it is averaged out over a shorter time. However, I think your explanation of greater portfolio concentration in historically negative alpha buckets (such as LV) is a more likely reason for the poor performance relative to the model, and I would add that DFA has a competitive advantage in SCV that it doesn’t have in other areas. My understanding is that over time DFA has become something of a de facto market maker in SCV stocks. So, while others may face high trading costs, DFA often earns a premium by being a liquidity provider to large traders. I think this advantage is unique to the SCV space, so it may be expected that DFA will outperform competitors in SCV (i.e. 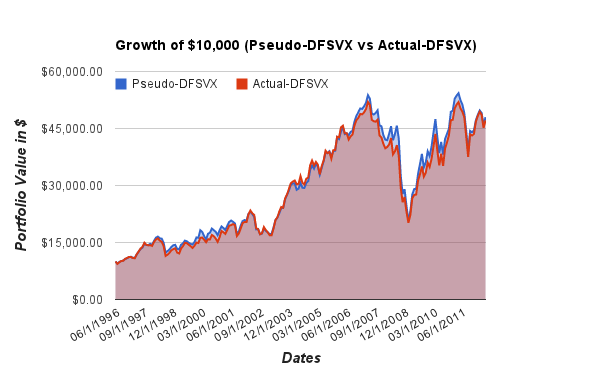 DFSVX has a big advantage) but will perform in-line with competitors for more modestly tilted portfolios such as Vector. For example, the SCV ETFs I looked at in this previous post have less tilt that DFSVX, and their negative alphas are similar to Vector. Also, this article has a brief comment from Robert Deere on DFA’s market maker advantage in SCV: “We make it as painful for them as possible” link here. I don’t think DFA can drive such a hard bargain outside of the small cap space. There is a very interesting paper by Donald Keim: “An Analysis of Mutual Fund Design” which discusses and attempts to measure the benefit of DFA’s “trading strategy” and “investment rules” on the performance of DFA’s SCV fund. This paper captures many of the reasons why DFA is able to outperform competitors in SCV. A 50/50 split of TSM and SV would be +11.7%, 0.3% less than Vector. With live data over last 5 years, we have 15.7% for VTSAX, 16.2% for DFVEX, and 16.7% for DFSVX, the 50/50 was identical to 100% US Vector. PS – Vector is a cheaper way to get 50/50 exposure, not more expensive. DFA is selling about 25% of DFSVX portfolio every year to maintain asset class purity, a constraint not placed on Vector as stocks are allowed to migrate across the market cap and value/growth spectrum with very minimal buying/selling. Fund turnover is typically in the 5-10% range annually and the transactions occur in the mid cap and large cap segments were trading costs are cheaper. Not to mention a portfolio doesn’t have to pay the cost of rebalancing between TSM and SV. Vector vs 50/50 returns will differ in the short run as Vector is well spread out across all stocks while the 50/50 is a “barbell” – concentrated in large cap/growth and small value exclusively. The regressions I ran showed a negative alpha (using Fama-French factors from the Ken French website) for the Vector fund. I ran the regression using monthly returns over the period from February 2006 thru August 2012. Results may be different if more recent returns are included, but I used all data available at the time the post was written. The monthly returns were calculated using data from Yahoo! Finance, which can be prone to errors, but the typical error I’ve found in the Yahoo! data is a missing dividend. I checked the data for each fund to see that none of the expected dividends were missing. If you have a monthly better data series for this particular range of dates, I’d be happy to rerun the regression. How are the returns from 1928 calculated? Obviously there isn’t live fund data from that time. I assume DFA also reconstructed an estimate based on factor loadings. Did they assume the alpha term was zero? Or something else?